Our Commissioners are, from left to right, Chairman Todd McNeill, Larry Rhodes, Paula Perry, Larry Dix, Vice Chair William Sands. In Ashe, as in most counties throughout North Carolina, policy decisions are made by a Board of County Commissioners. 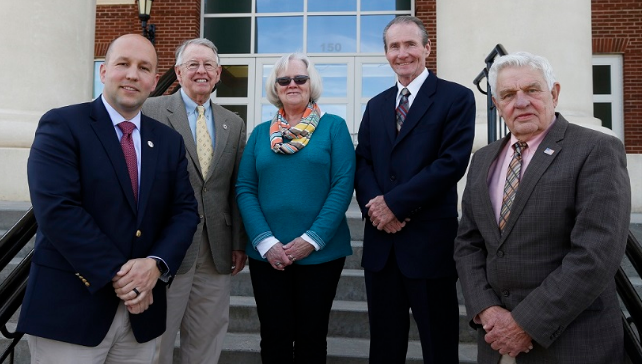 Ashe County’s Board of Commissioners is comprised of five members of various local communities, chosen by Ashe’s citizenry to represent them in local, regional, statewide and even national affairs. The Board holds regularly scheduled meetings at 9:00 a.m. on the first and third Monday of each month. Click here for Commissioner meeting minutes beginning January 2014 - present. As elected representatives for the population of Ashe County, each member of the Board strives continuously to educate themselves on current community, state and federal events, practice sound judgment and stewardship in usage of County resources, and provide accessible, high-quality services while maintaining support for viable local initiatives. Ever mindful of the impending growth of both local economy and population, the Ashe County Commissioners also work diligently to improve quality of life, provide steady employment opportunities and plan accordingly for future needs.